2011 Bordeaux wine is a vintage of selection. All agricultural regions enjoy, or suffer from, the capricious vagaries of Mother Nature. 2011 Bordeaux wine is the product of one of the more difficult growing seasons in recent history. Things started off normal. After the cold, dry winter faded, spring arrived. But far too early. Bud break took place at the end of March. In fact, by the time April rolled around, much of Bordeaux was enjoying summery conditions. April was hot: the second hottest April on record since 1900! May was almost as hot and dry, which brought about an early flowering. The first half of the year was one of the warmest periods enjoyed by the region in six decades! However, accompanying the warmth was very little rain. The drought conditions were exacerbated by a heat spike in June that caused serious problems due to lack of water in the vineyards. Many growers suffered as grapes were ruined by sunburn. Cabernet Sauvignon in dry soil was hit the hardest. By the time the Bordeaux weather usually warms up, things changed again. This time it was worse. In July, the warm, dry summer conditions that had been taking place since February reversed direction. July became one of the coldest months in over three decades! While some rain fell at the right moment, offering nourishment for the vines for many growers, fears of rot were not uncommon. For other growers, the rains were too little, too late. Producers who had enjoyed back-to-back stunning vintages with 2009 and 2010 were faced with a myriad of choices, all of which requiring extensive work and selection in the vineyards. If that wasn’t enough to cope with, a massive storm slammed in the Northern Medoc, September 10, causing some estates to begin their harvest earlier than anticipated and further reducing their yields. August 17 marked the start of the harvest for the white wines. This was, on average, about two weeks earlier than usual. September 5 saw the first picking of Merlot. This was followed one week later by the Cabernet. Depending on the vineyard, most of the harvest was concluded by late September or early October. 2011 will be known as one of the earliest harvests in history, competing with 1893 for that record for some producers. Producers that were willing to ruthlessly discard unripe or damaged berries were able to make good wine. Yields are low. Interestingly, a greater percentage of the harvest was relegated to the Grand Vin in 2011, than in 2010 or 2009. Yet the total amount of wine is less in 2011. This is due to greater selection taking place, problems encountered with the younger vines, the development of rot and damage caused by drought and hail. For some chateaux, they set records for the smallest yields in their history. Others had to go back to 1961 to find a year with such low yields. Low yields are a positive sign because it leads to concentrated wine. At this moment, it looks like vineyards planted on water retentive, clay or limestone terroir produced the better wines from the difficult vintage. Selection was paramount for growers. Fruit from gravel and clay terroir that had enough water to feed the vines produced the best wine. Fruit from old vines, which reach deeper into the soils, helped as well, as young vines suffered. What does this mean for 2011 Bordeaux wine? 2011 Bordeaux wine is a good, but not great vintage with some nice wines. There is more red fruit than black fruit. You will not find dark flavors than you will experience in higher-alcohol, riper vintages like 2010, 2009 or 2005. You’ll taste more cassis and cherry and less blackberry or liqueur. Very little licorice or other ripe sensations appear in most 2011 Bordeaux wine. 2011 Bordeaux wine is generally speaking, fresh, bright, aromatic and show more acidity than the previously mentioned vintages. The wines are less concentrated in flavor this vintage when compared with recent years like 2009 and 2010. However, the wines are ripe. Because they are lower in alcohol, you have less of a voluptuous feeling in the mouth. The problem with many wines is too much extraction and wood. Using the same techniques in 2011 that were practiced in 2010 will not return good results. Those wines feel dry in the mouth. 2011 Bordeaux wine is not a vintage to cellar for decades. Similar to 2001 Bordeaux, many of the wines will start drinking well between 5 and 10 years after the vintage. 2011 Bordeaux shares another commonality with 2001 Bordeaux, a myriad of chateaux from Pomerol produced outstanding wine. Due to their low production, the high level of quality coupled with strong demand, Pomerol is the only appellation to consider buying as a future. 2011 Bordeaux wine is also another excellent year for the sweet Bordeaux wines of Sauternes and Barsac as well as being strong for the white wines of Bordeaux. 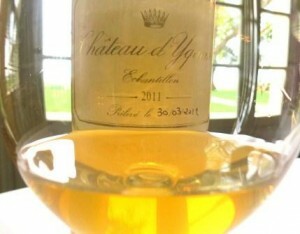 In fact, the 2011 Bordeaux wine of the vintage is probably Chateau d’Yquem. 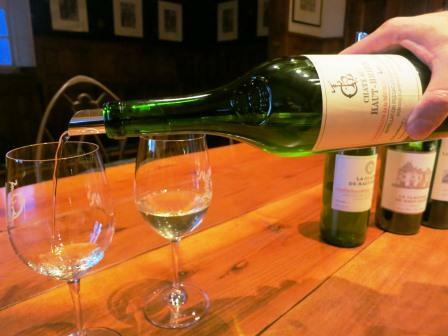 The 2011 dry, white Bordeaux wine from Pessac Leognan is the fifth vintage in a row for quality wine from that appellation. The dry, white, 2011 Bordeaux wine is Haut Brion Blanc! However, as that wine is priced beyond what most people can afford, look for Domaine de Chevalier, Smith Haut Lafitte or Malartic Lagraviere. To buy or not to buy 2011 Bordeaux wine? That’s the question. Buying 2011 Bordeaux wine comes to down price and quality. Every chateaux owner and director knows prices need to come down. How far they will drop is the question. Most owners and directors feel their wines are priced fair. it is their neighbors that need to give the biggest discounts. For the wines to sell through to consumers, the wines need to take a big step back in price. I’d like to see reductions from 2010 drop by 40% to 50% for many properties. Based on numerous conversations, that is unlikely to happen for 2011 Bordeaux wine. With all that in mind, 2011 Bordeaux wine is not a vintage to invest in, which means it’s not necessary to buy the wines as futures. It’s a year made for drinkers. Some vintages favor the chateaux. Other years, the consumer sets the price. The 2011 futures campaign will be a mini war between the owners, who want the most money, and the consumer, who will rightly demand the lowest possible price after spending so much money to buy 2009 and 2010 Bordeaux wine. In this difficult, uneven vintage, some estates are going to outperform others. 2011 Bordeaux wine is not a vintage to buy blindly. A few more important points you should consider when thinking about what wines to purchase. What might happen in 2012? Of course it’s far too early to know. But 2012 bears some resemblance to 2011. The winter was one of the driest on record. There is very little water in the soil at the moment. It’s April now and very warm in Bordeaux. If the region does not receive adequate rain to help feed the vines, the vines will be stressed and might not gain phenolic ripeness. You also need to add into the equation that if the region does not receive enough rain, there will be even less wine than we saw with 2011 Bordeaux wine! If that becomes the case, 2009 and 2010 could become even more collectible as consumers and collectors with a thirst for the best wines will want to own even more of those already legendary vintages. It is our opinion that in time, due to the unique, opulent style of the wines, coupled with the extraordinary number of 100 Pt wines, according to Robert Parker, 2009 Bordeaux will become the most collectible vintage in history. But that’s a fun conversation best suited for another day.